Renfrewshire’s Provost Anne Hall paid tribute to the UK’s Merchant Navy in a special flag-raising ceremony. The Red Ensign flag was raised by Provost Hall outside Renfrewshire Council’s HQ on Cotton Street to mark Merchant Navy Day along with over 400 local authorities across the UK. Merchant Navy Day has been commemorated since 2000 on 3 September, the anniversary of the sinking of the SS Athenia, the first British merchant vessel lost during World War 2. Although many hundreds of merchant ships and thousands of seafarers would meet the same fate in the years to come, Merchant Navy Day honours the brave men and women who kept on seafaring during both World Wars. But the day also recognises the huge contribution today’s Merchant Navy make, which we rely on for 95% of our imports including half the food we eat. This year’s campaign to fly the Red Ensign was started by the charity Seafarers UK, which called for Merchant Navy Day to be officially recognised by the Government. Provost Hall said: “I was deeply honoured to raise the Red Ensign flag for Merchant Navy Day. People often forget that many seafarers lost their lives during World War 2 alongside our Armed Forces. They also deserve our respect and honour. 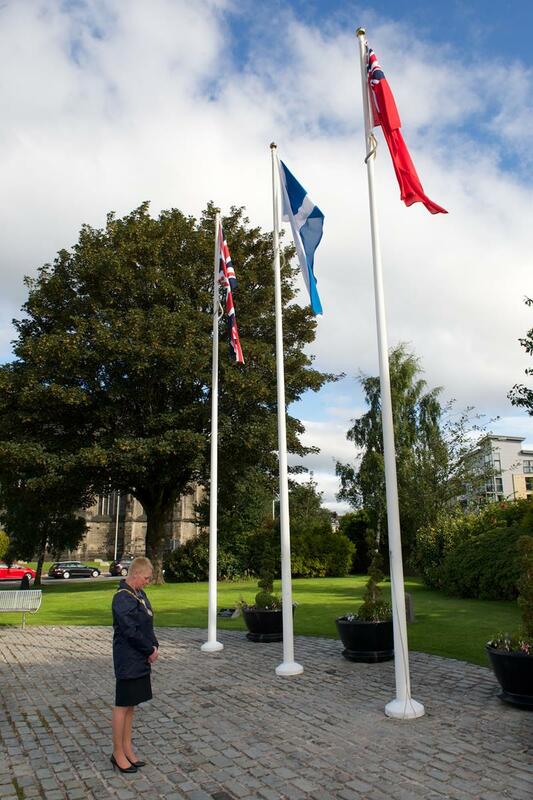 The Red Ensign flag was flown outside Renfrewshire House from 10am on the 3 September. Seafarers UK is a charity set up to support those in the maritime community, by providing funding to support seafarers in need and their families.